As hoped, EUR/USD rallied a bit higher to the 38% Fibonacci retracement level, and after hanging out just a bit above 1.56, the pair dropped as the US Dollar rallied on comments from Fed Chairman Bernanke. Our trade hit full profit target. 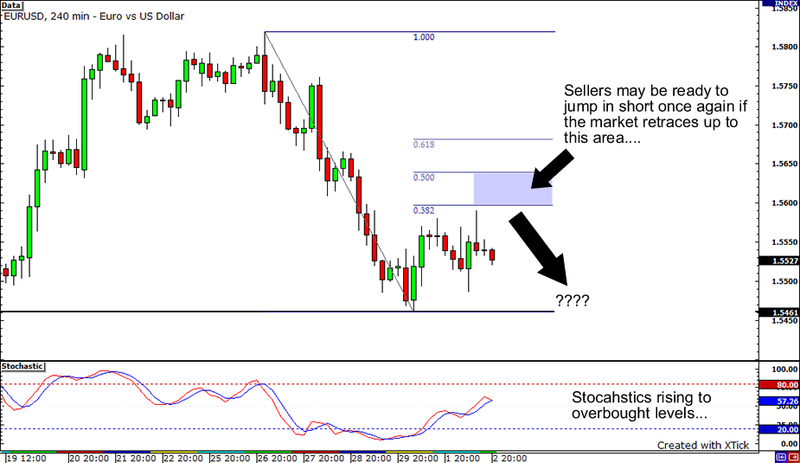 We have a nice chart setup on EUR/USD which may give us an opportunity for a short term trade. It looks like pair is in range mode after the US Dollar made a strong move against the Euro, moving from a high of just above 1.58 to a low just above 1.5450. Without any major news for both the Greenback or Euro tomorrow, I feel that if the market makes its way back up to 1.5600, we may see sellers waiting to hold that 38% Fibonacci retracement area down. Stochastics are just above neutral, so if there is further retracement to go, it hasn’t run out of steam yet. Stay tuned for updates, good luck and good trading!